Russell & Kitty here. Stretch Tuesday is here again and we would like to shed some light on our topic. 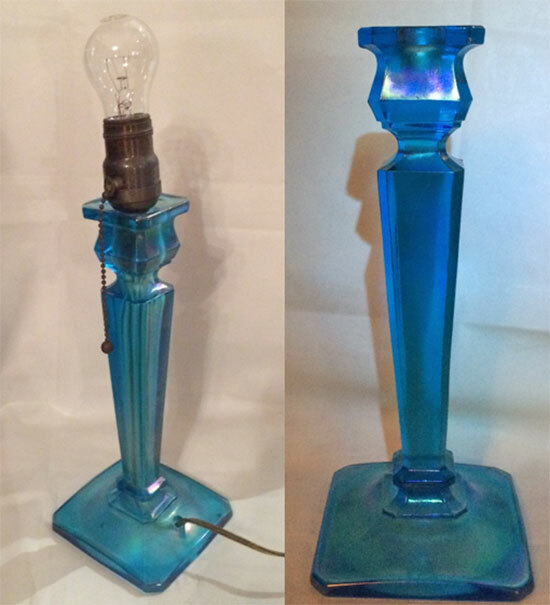 Like carnival glass, there are stretch glass candle lamps made by Northwood. Both the candle lamps and the candlesticks are listed as #651. They are 11″ high and 4 1/2″ base and heavy so they won’t fall over! The candle lamp is on the left and the candlestick is on the right. The candle lamp is hollow in the center for the light cord, but the candlestick is a heavy solid piece of glass. 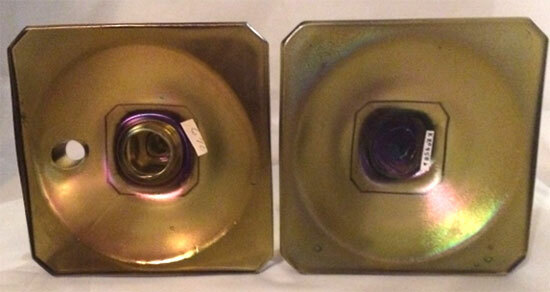 The candle lamp on the left shows the hole in the center as well as the hole in the base for the electrical cord. 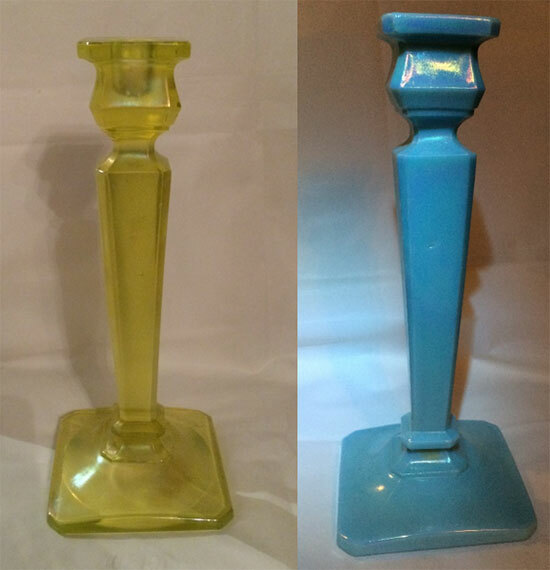 The base on the right is a solid candlestick from the same mold. The difference between the candlesticks and the candle lamps is a molded hole down the center of the candle lamp, and a molded hole on the base for the lamp wire; no holes in the candlesticks. It is not that easy to make the molded hole the length of the stick. The process involved pouring the glass upside down in the mold and a mandrel affixed to the plunger which would drive through the molten glass creating the lengthwise hole. This involves temperature control and perfect alignment of the plunger with the long mandrel and short punch. The breakage rate was very high and very few lamps survived. As far as we know, there are 2 sapphire blue, 1 russet and another damaged russet lamps that have survived. This expensive mold continued to be used for candlesticks in sapphire, russet, topaz, and Jade blue (opaque blue). As far as we know, there are no glass lamp shades to go on the candle lamp. Rose Presznick said that the cloth shade is probably original to the candle lamp as that is how she found them. We’ve not seen any shade that would even fit the candle lamps. Actually, the candlesticks are also difficult to find. The candle lamps are rare. 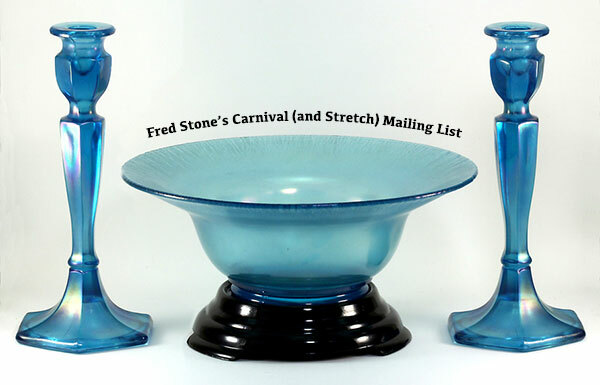 So rare that years ago, we purchased Rose and Joe Presznick’s stretch glass collection for the pair of sapphire blue (same color as celeste blue) candle lamps and a couple of other rare pieces of stretch glass. One week many years ago, Russell was working out of town when 17 huge boxes of glass arrived via railroad delivery to our home which is on a very steep hillside. They delivered them to our sidewalk not to the front door which was two flights up in the middle of the day! The only other person in the neighborhood was my next door neighbor. Between the two of us, we unpacked the boxes and carried the glass up the hill, up the stairs to the front door in much smaller boxes. Unloading the first box was like Christmas and with each additional box, it was like a very bad nightmare!!! After a while we were leaving the boxes on the stairs just to get them off the sidewalk before the school kids walked by! All of the boxes were on the stairs by 5pm when the commuters would start walking by. Got all of the glass inside the house by around 11pm. I was up most of the night unpacking the glass sitting on the floor and scooting from box to box (too tired to get up and down) in the front hallway, living room, dining room, office and kitchen! Had a trail of packing and glass all over. Both my neighbor and myself were exhausted the next day. Good thing we were young at the time! Yes, we are still friends. We would love your feedback. 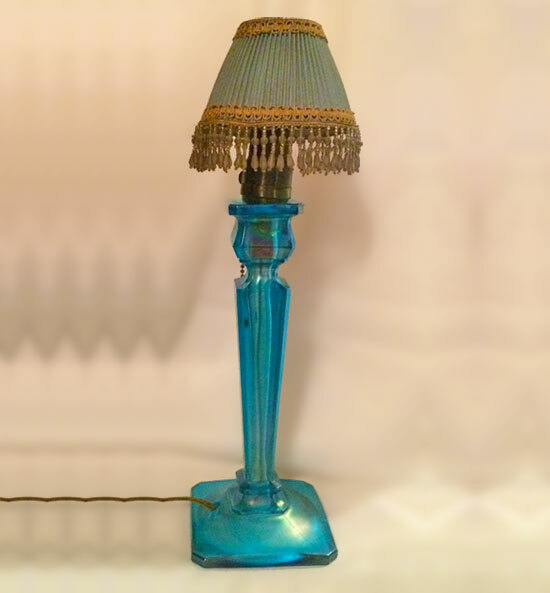 Do you have any Candle Lamps in topaz or Jade Blue? Might you have the candlestick or the candle lamps in colors not mentioned? Has anyone seen any stretch glass shades that would fit the candle lamps?